Quit pushing those heavy shopping carts with squeaky wheels at your local grocer and use the reliable Load Runner XL Jumbo Cart from Narita. The Load Runner XL Jumbo Cart is a heavy-gauge steel cart with 4-wheels that can support up to 150 lbs. of goods. Take the Load Runner XL Jumbo Cart with you anywhere - it assembles easily, weighs only 16 lbs., and folds up for compact storage! Measures 21.5L x 25.5W x 40H inches and is available in the black or red finish of your choice. Assembled Product Dimensions: 17L x 20W x 23H in. Since 1986, Narita Trading has foreseen the future of shopping cart needs and created Shopping Cart lines of varying sizes. Since then, we have become the largest Shopping Cart supplier and manufacturer. There are many reasons why we are ahead of our competition. 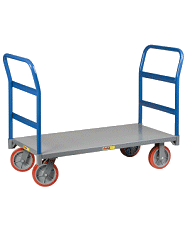 We upgrade the sturdiness and reliabilities of our carts continuously and we take pride in the appearance of our cart. Over the years, we have monitored and studied our competition to remain ahead of the game. Our tight quality control, with each shipment inspected by in house specialist, assures our customers that we put out the highest quality of Shopping Carts and other various household items. We have an improvement program to constantly design new features and redesign our old products to fix any possible flaws. More importantly, we have listened to the consumers' needs as well as our dealers' suggestions.